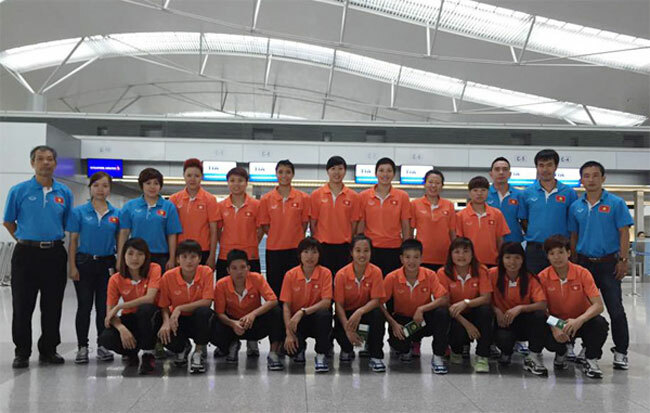 HA NOI (VNS) — The Viet Nam national women's futsal team are targeting a semi-final berth at the 2015 Asian Football Confederation Women's Futsal Championships to be held in Nilai, Malaysia, on September 21-26. Eight teams will be drawn into two groups with the winners and runners-up advancing to the semi-finals. Indonesia have been removed from the competition due to a FIFA suspension, while Jordan have withdrawn. Viet Nam are in Group B with Japan, China and Thailand. Group A consists of Iran, Malaysia, Uzbekistan and Hong Kong. "It is a challenge for Viet Nam in a tournament where they meet strong rivals including Japan and Thailand. However, the team will aim to reach the semi-finals," said head coach Truong Quoc Tuan. Viet Nam will face Japan on September 21, China on September 22 and Thailand one day later. In preparation for the event, the squad yesterday left for Kuala Lumpur, Malaysia, to train intensively. They will have two friendly matches against the hosts on Wednesday and Friday. Before Malaysia, the team had trained for nearly two months in HCM City's Thai Son Nam Gymnasium.